The present study examined the effect of L. japonica extract on the survival of neurons damaged by glutamate excitotoxicity, using primary cultures of rat cortical cell as an in vitro model of neurodegenerative disease. To elucidate the mechanism, the effects of L. japonica extract were tested for an increase in the Calcium [Ca 2+ ] and nitric oxide (NO) levels, cellular oxidation, mitochondrial membrane potential and antioxidative enzymes. All chemicals for rat cortical cell cultures and biochemical assays were purchased from Sigma-Aldrich Chemical Co. (St. Louis, MO), unless stated otherwise. Fetal bovine serum was purchased from Hyclone Co. (Logan, Utah). MK-801 used as positive control was purchased from Research Biochemicals International (Natick, MA). Urethane and triton X-100 were purchased from Junsei Chemical Co. (Tokyo, Japan) and Yakuri Chemical Co. (Osaka, Japan), respectively. Dried flower of Lonicera japonica was purchased from Daejeon Oriental medicine Market, Daejeon, Korea and identified by the Dr. Young-Bae Seo, a professor of the College of Oriental Medicine, Daejeon University. Voucher specimen (CJ0001M) has been deposited in this institute. Primary cultures of mixed cortical cells containing both neuronal and glial cells were prepared from 17~19-day-old fetal Sprague-Dawley rats as described previously. In brief, the trypsin-dissociated cortical cells were plated on multi well culture plates (Corning, NY) coated with collagen at a density of 1×10 6 cells per well. The cortical cells were grown in Dulbecco's modiﬁed Eagle's medium (DMEM) containing 10% heat-inactivated fetal bovine serum with penicillin (100 IU/ml) and streptomycin (10 μg/ml) at 37o C in a humidified atmosphere of 95% air-5% Carbon dioxide (CO 2 ). Cultures were allowed to mature for 17 days before being used for experiments. Our mixed cortical cultures consisted of approximately 70~75% cells immunopositive for neuron-specific enolase, and 25~30% cells immunopositive for glial fibrillary acidic protein as determined by immunocytochemical staining methods. All experiments were performed with Ethical Approval of Kangwon National University. Test samples were dissolved in Dimethyl sulfoxide (DMSO) (final culture concentration, 0.1%); and, preliminary studies indicated that the solvent had no effect on cell viability of control and glutamate-treated cells at the concentration used. Seventeen-day-old cortical cell cultures were washed with DMEM and incubated with test samples for 2 hours. The cultured cells were then exposed to 200 μM L-glutamate. After 24 hours incubation in the presence of test samples, the cultures were assessed for the extent of neuronal damage by measuring lactate dehydrogenase (LDH) in the media. Data are expressed as the percentage protection relative to vehicle-treated control cultures. Values shown are the mean ± Standard deviation (SD) of three experiments (3-4 cultures per experiment). The intracellular calcium was determined by ratio fluorometry using Ca 2+ specific dye, Fura 2-AM. , In brief, 2 hours before exposure to 200 μM glutamate, cultures grown on 48-well plates were treated with L. japonica extracts sample and 5 μM Fura-2 AM in phosphate-buffered saline (PBS, pH 7.2) at 37o C in a humidified atmosphere of 95% air - 5% CO 2 . The change of [Ca 2+ ] i was measured 3 hours after exposure to glutamate. Fura-2 fluorescence was measured with a spectroflurometer by exciting cells at 340 and 380 nm and measuring light emission at 520 nm. The level of NO formed was determined by measuring the content of nitrite released into the medium using the method of Dawson et al. The culture medium was reacted with Griess reagent and the absorbance was then read at 550 nm. The concentration was determined against a nitrite standard curve. Values shown are the mean ± SD of three experiments (3-4 cultures per experiment). The relative level of free radicals, i.e. peroxide, in cultured cells was measured with the oxidation-sensitive compound, 2',7'-dichlorofluorescein diacetate (2,7-DCF-DA) by the method of Goodman and Mattson. , Cells were loaded with DCF-DA (50 μM, 50 min-incubation) followed by three washes in Hank's Balanced Salt Solution (HBSS). DCF fluorescence was then determined after 3 hours' incubation by measuring light emitted at 530 nm of exciting cells with light at 485 nm. Values shown are the mean ± SD of three experiments (3-4 cultures per experiment). To measure the mitochondrial membrane potential, we used rhodamine-123, a cell-permeable cationic fluorescent probe that is selectively sequestered by viable mitochondria. After exposure to glutamate, the cells were incubated for 30 minutes at 37 o C with rhodamine123 (5 μM). Cells were then washed with 20 mM Hepes-Na (final pH 7.4). The fluorescence was determined at excitation and emission wavelengths of 485 and 530 nm, respectively. Cells from three culture plates were pooled in 2 ml of 0.1 M phosphate buffer (pH 7.4) and homogenized. The homogenate was centrifuged for 30 minutes at 3000×g at 4 o C and the supernatant (cytosolic and mitochondrial fractions) collected for the measurements of antioxidative enzyme activity. The activity of superoxide dismutase was determined according to the method of McCord and Fridovich by xanthine-xanthine oxidase reaction. Glutathione reductase activity was measured according to the method of Carlberg and Mannervik based on the reduction of oxidized gluthathione (GSSG) by glutathione reductase and nicotinamide adenine dinucleotide phosphate-oxidase (NADPH) . Glutathione peroxidase activity was determined by quantifying the rate of oxidation of glutathione to GSSG by cumene hydroperoxide, a reaction catalyzed by glutathione peroxide. Values shown are the mean ± SD of three experiments (3-4 cultures per experiment). Statistical significance was determined by one-way ANalysis Of VAriance (ANOVA) and, if significant, group means were compared by post-hoc analysis using Tukey multiple comparison of means. Values shown are the mean ± SD of three experiments (3-4 cultures per experiment). 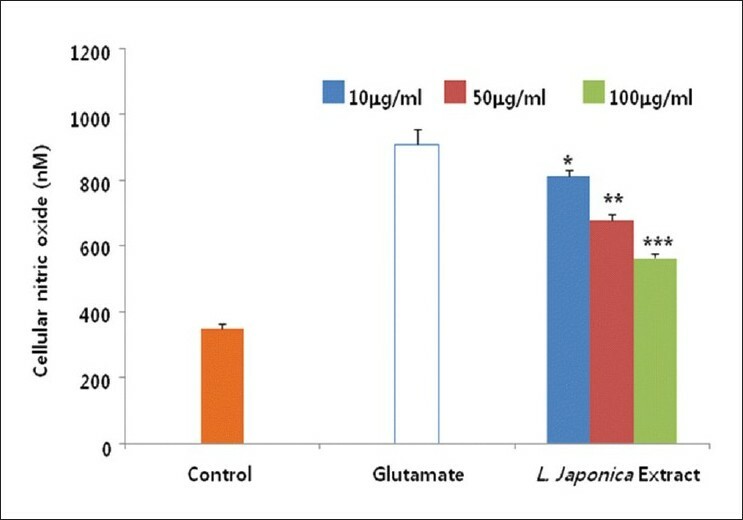 We previously reported that methanolic extract of L. japonica showed neuroprotective activity against glutamate-induced neurotoxicity in cultured rat cortical cells. We have investigated neuroprotective activities of L. japonica extract, using primary cultures of rat cortical neurons injured with glutamate [Figure 1]. L. japonica extract protected primary cultures of rat cortical cells against glutamate-induced neurotoxicity in a dose dependent manner. In order to reveal how L. japonica extract protected against glutamate-induced neurotoxicity, we have investigated the mechanisms of action using glutamate-injured primary cultures of rat cortical cells. Glutamate released to neuronal cells actiavtes several types of pre- and post-synaptic glutamate receptors such as, N-methyl D-aspartate (NMDA), α-amino-3-hydroxy-5-methyl-4-isoxazolepropionic acid receptor (AMPA) and/or Kainic acid (KA). Then, intracellular calcium concentration was increased by glutamate excitotoxicity and it may lead to mitochondrial dysfunction, generation of reactive oxygen species, and activation of proteases, phospholipases, and endonucleases, leading to neuronal cell death. In addition, the excessive Ca 2+ influx is followed by the activation of NO synthase (NOS) and subsequent overproduction of NO. Thus, the effect of L. japonica extract on the increase in the content of [Ca 2+ ] i and NO induced by glutamate was determined. The [Ca 2+ ] i increased by glutamate treatment was significantly and effectively inhibited by the treatment of L. japonica extract at the concentration ranged from 10.0 to 100.0 μg/ml [Figure 2]. 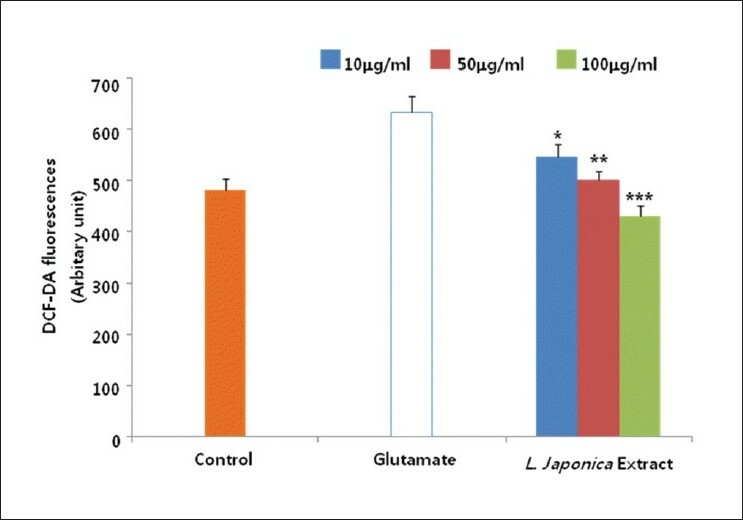 L. japonica extract also significantly reduced over-production of NO in cortical cells exposed to glutamate in a dose-dependent manner [Figure 3]. It is one of the characteristic features of glutamate-induced neurotoxicity that mitochondrial membrane potential is decreased. The excessive Ca 2+ accumulation in mitochondria triggers mitochondrial damage. Thus, we investigated effect of L. japonica extract on mitochondrial membrane potential. 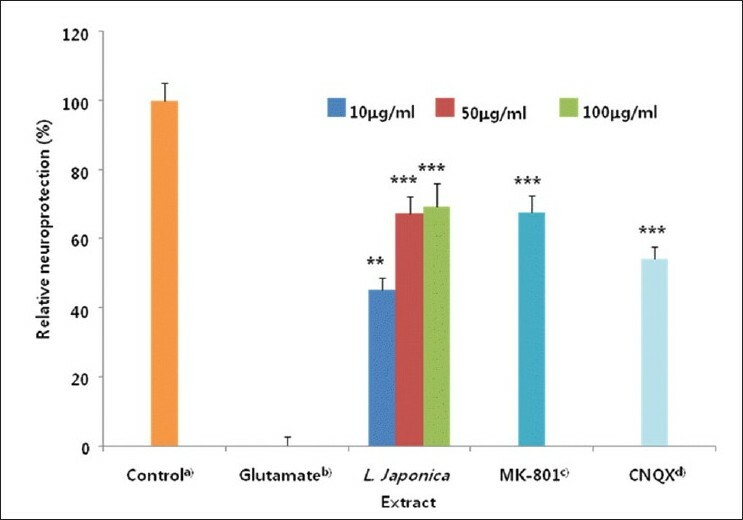 L. japonica extract treatment significantly restored mitochondrial membrane potential up to 90% of control cells [Figure 4]. This result might be partially due to reduced oxidative stress and inhibition of Ca 2+ influx. Glutamate-induced toxicity is known to be mediated by oxidative stress which involves reactive oxygen species such as hydroxyl radicals and superoxide anions. We measured the effect of L. japonica extract on the content of cellular peroxide using the specific fluorescent dye, 2,7-DCF-DA. When cultured cortical cells were treated with glutamate, the cellular peroxide content was increased up to 3 hours after treatment. 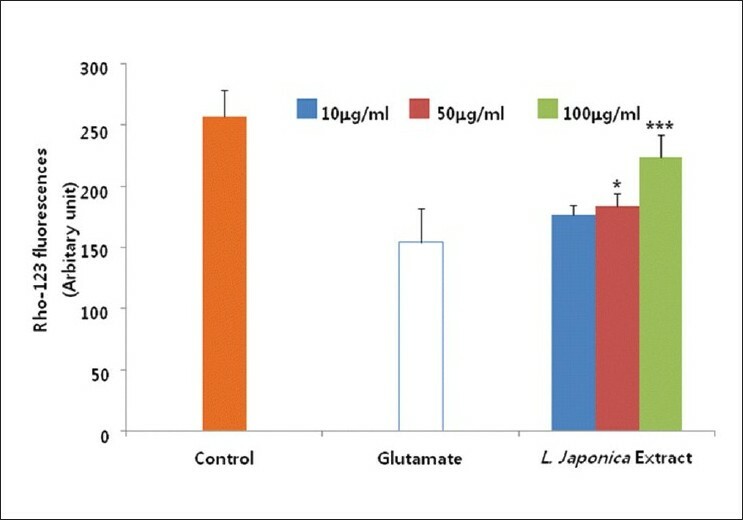 The increased cellular peroxides induced by glutamate were effectively reduced by the treatment with L. japonica extract [Figure 5]. Glutamate-induced oxidative stress is also known to deplete intracellular Glutathione (GSH), and reduce the activities of antioxidative enzymes such as superoxide dismutase, glutathione reductase and glutathione peroxidase. ,, We investigated the effect of L. japonica extract on the activities of antioxidant enzymes in glutamate-injured rat cortical cells. 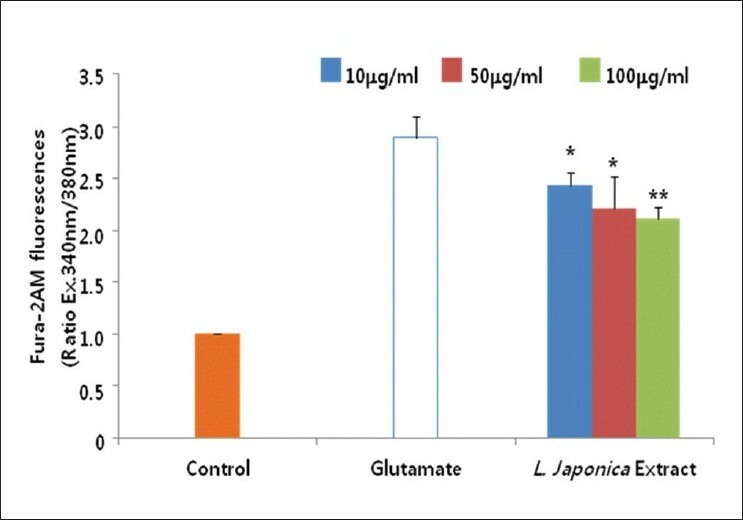 Treatment with L. japonica extract significantly preserved the activities of superoxide dismutase, glutathione peroxidase and glutathione reductase to the control level in primary cultures of rat cortical cells injured with glutamate [Table 1]. From these results, it could be suggested that L. japonica extract reduced the formation of reactive oxygen species (ROS) in cells by enhancing the antioxidative defense system. Also, L. japonica extract showed free radical scavenging activity (data not shown). At present, the cellular and molecular mechanisms that underlie the action of L. japonica extract are not fully understood. However, our results show that L. japonica extract significantly protected primary cultured neuronal cells against glutamate-induced oxidative stress via antioxidative activities. Therefore, we conclude that L. japonica extract might offer useful therapeutic choices in the treatment of neurodegenerative disorders caused by excitotoxicity. This work was supported by the Grant of the Korean Ministry of Education, Science and Technology (The Regional Core Research Program/Medical & Bio-Material Research Center). 1. Aarts MM, Tymianski M. Novel treatment of excitotoxicity: Targeted disruption of intracellular signalling from glutamate receptors. Biochem Pharmacol 2003;66:877-86. 2. Choi DW, Koh J, Peters S. Pharmacology of glutamate neurotoxicity in cortical cell culture: Attenuation by NMDA antagonists. J Neurosci 1988;8:185-96. 3. Lipton SA, Rosenberg PA. Excitatory amino acids as a final common pathway for neurologic disorders. N Engl J Med 1994;330:613-22. 4. Rajendra W, Aamugam A, Jeyaseelan K. Neuroprotection and peptide toxins. Brain Res Brain Res Rev 2004;45:125-41. 5. Won JB, Ma CJ. Neuroprotective activities of some medicinal plants against glutamate-induced neurotoxicity in primary cultures of rat cortical cells. Nat Prod Sci 2009;15:125-9. 6. Lin LM, Zhang XG, Zhu JJ, Gao HM, Wang ZM, Wang WH. Two new triterpenoid saponins from the flowers and buds of Lonicera japonica. J Asian Nat Prod Res 2008;10:925-9. 7. Kim SR, Koo KA, Sung SH, Ma CJ, Yoon JS, Kim YC. Iridoids from Scrophularia buergeriana attenuate glutamate-induced neurotoxicity in rat cortical cultures. J Neurosci Res 2003;74:948-95. 8. Tang XH, Chen Jin, Yang XL, Yan LF, Gao J. Preservation on calcium homeostasis is involved in mitochondrial protection of Limonium sinense against liver damage in mice. Pharmacogn Mag 2010;6:191-7. 9. Dawson VL, Brahmbhatt HP, Mong JA, Dawson TM. Expression of inducible nitric oxide synthase causes delayed neurotoxicity in primary mixed neuronal-glial cortical cultures. Neuropharmacology 1994;33:1425-30. 10. Goodman Y, Mattson MP. Selected forms of b-amyloid precursor protein protect hippocampal neurons against amyloid b-peptide induced oxidative injury. Exp Neurol 1994;128:1-12. 11. Momtaz S, Lall N, Hussein A, Ostad SN, Abdollahi M. Investigation of the possible biological activities of a poisonous South African plant; Hyaenanche globosa (Euphorbiaceae). Pharmacogn Mag 2010;6:34-41. 12. Li YH, Gong PL. Neuroprotective effect of dauricine in cortical neuron culture exposed to hypoxia and hypoglycemia: Involvement of correcting perturbed calcium homeostasis. Can J Physiol Pharmacol 2007;85:621-7. 13. Mccord JM, Fridovichi I. Superoxide dismutase. J Biol Chem 1969;244:6049-55. 14. Calberg I, Mannervik B. Purification and characterization of the flavoenzyme glutathione redcutase from rat liver. J Biol Chem 1975;250:5475-80. 15. Flohe L, Gunzler WA. Assays of glutathione peroxidase. Methods Enzymol 1984;105:114-21. 16. Nabavi SM, Ebrahimzadeh MA, Nabavi SF, Fazelian M, Eslami B. In vitro antioxidant and free radical scavenging activity of Diospyros lotus and Pyrus boissieriana growing in Iran. Pharmacogn Mag 2009;5:122-6. 17. Lowry O, Roseberough H, Farr A, Ramdall R. Protein measurement with folin phenol reagent. J Biol Chem 1951;193:265-75. 18. Hazzell AS. Excitotoxic mechanisms in stroke: An update of concepts and treatment strategies. Neurochem Int 2007;50:941-53. 19. Duchen M. Mitochondria and calcium: From cell signaling to cell death. J Physiol 2000;529:57-68. 20. Halestrap AP. Calcium, mitochondria and reperfusion injury: A pore way to die. Biochem Soc Trans 2006;34:232-7. 21. Love S. Oxidative stress in brain ischemia. Brain Pathol 1999;9:119-31. 22. Nithiya P, Mohan K. Antioxidative effect of Trichosanthes tricuspidata root extract on sildenafil induced migraine in albino mice. Pharmacognosy Res 2009;1:402-5. 23. Almeida A, Heales SJ, Bolanos JP, Medina JM. Glutamate neurotoxicity is associated with nitric oxide-mediated mitochondrial dysfunction and glutathione depletion. Brain Res 1998;709:209-16. 24. Coyle JT, Puttfarcken P. Oxidative stress, glutamate, and neurodegenerative disorders. Science 1993;262:689-95. 25. Buyukokuroglu ME, Gulcin I. In vitro antioxidant and antiradical properties of Hippophae rhamnoides L. Pharmacogn Mag 2009;5:189-95. Park, H.-S. and Park, K.-I. and Lee, D.-H. and Kang, S.-R. and Nagappan, A. and Kim, J.-A. and Kim, E.H. and Lee, W.S. and Shin, S.C. and Hah, Y.-S. and Kim, G.-S.